There are two wild-type yak (Weiner et al. 2003). Tibetan Nomads in Yushu region near Jyekundo in the Tibetan Autonomous Prefecture have recognized the "Long-Hair Forehead Fur Yak" of wild yak for hundreds of years - and named it for its long fiber and long forehead topknot. 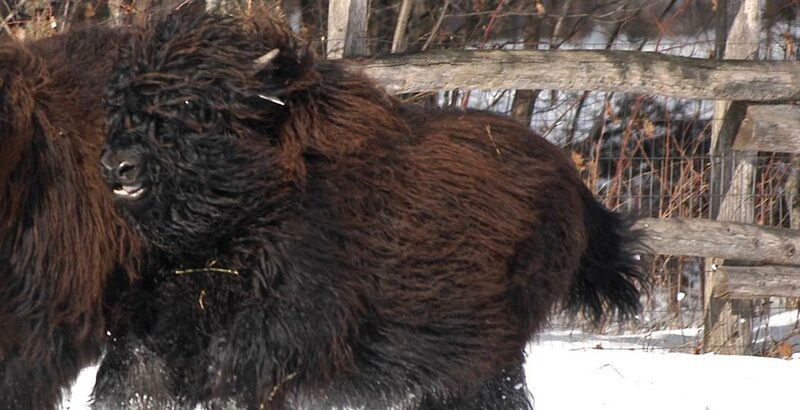 The Prairie Sky breed is most closely related to this wild-type yak, currently only found in the Tibetan highlands. Interbreeding between domestic and wild yaks in reserves, presents a great threat to the remaining wild yak population in Tibet (Schaller and Liu 1996, Harris et al. 1999, Smith and Xie 2008, Rawat and Sankar 2011). The Long-hair fur forehead yak (རི་མོ་བ། མགོ སྤུ འབྲོང) is the genetic base for the Super and Extreme Wooly Yaks in the North American Yak population, and deserves to be preserved as a Heritage Breed. Read more about the difference between Wild and Domestic Yak here. We are proud members of the first and premier yak association, the International Yak Association (IYAK). We are enthusiastic IYAK Board members and serve on the Communications and Genome Committees. It’s a wonderful group of dedicated and knowledgable yakers, many of which are experts that were early adapters and “started the whole thing” by importing the first yak from Canada in the 60’s, and many more who “get it”, are yak lovers, and are active in creating this new and exciting energy at IYAK. Check us out at here. Superlock is an Imperial Tibean Yak bull who has sired most of our calves this year. He has a commanding presence, a gorgeous head with a super wooly top knot and that beautiful square shape that we try to breed for. His horns are thick (over 10" circumference at the base), what we like to see in a breeding bull and his hump and overall conformation is excellent. His fiber is thick and wooly and he has excellent coverage. Top that off with a super mellow temperament and you just can't help to be awed my him when you see him. We couldn't be more pleased with his offspring. This young bull is so handsome and is our 3 year old, Rastamon. He is going to make an awesome herd bull. He is sired by Superlock and his mother is Rena, one of our very favorite cows on the ranch. Rena has produced solid conformationally sound calves with excellent coverage and fiber characteristics and the wonderful personality that she wins every visitor over with. Rastamon just turning three, is already getting to work. He's gentle with young ones and is tending his maidens like a pro. He has a gorgeous and big horn base and an awesome wooly head. He ought to make some killer calves coming from two Imperial parents! As a son of Rena, he's showing his parents' great disposition, and is proving to be a wonderful herdsire to his small herd. Our Social Media associates have said "That is One nice bull." We can't agree more and can't wait to see his calves next year. This beautiful girl is a classic Imperial Wooly out Apple Berry of the Berry line, sired by Jette. She is one of the sweetest of our foundation herd, calls to us from the field and comes for daily scratches. Jet black and wooly with a fabulous top knot and coverage, wonderful confirmation and a history of exceptional calves and lineage behind her. She had an Imperial calf this year sired by Rolex, Brynjarberry. Bhorn means "bear" and she's another herd favorite. She is an Imperial cow sired by Dr.Lock and a member of our foundation herd of females that we never tire of looking at. Phenotypically she is just beautiful with a square head with terrific coverage, excellent conformation and solid bone and is an incredible mother. She had a beautiful Imperial heifer calf this year named Bjørn Wahlroos. Eleven is an Imperial Trim cow, sired by Dr.Lock that has that nice square short head that we always try to breed for along with all the other positive characteristics we look for in a foundation female. She had her first calf last spring, GLY Everest. This year she had Elijah or “Eli”. Appleberry Twist it the daughter of LDR Apple Berry and LDR Oliver Twist who is an Infinity son. She is a part of our foundation herd of cows and has a 2016 imperial trim bull calf on her side sired by Alsaka. We are thrilled about Appleberry Twist being a part of our herd! Her 2018 calf is by Superlock and Idunnberry (Idunn) is a real gem. Sitka is an Alaska daughter and a jet black silky Imperial . You can't help but notice her in the herd as a standout as she has great presence and style. She is an awesome mother and raises a great calf. Her 2014 calf is an Imperial just like her, named Saltora, who won the fiber contest as only a 7 month old in Denver out of 74 entries. Zsa Zsa is a new addition to our foundation cow family. We just love her - She is sweet, loves cookies, has an awesome personality and beautiful silky fiber. In addition to being beautiful she comes from a long line of even tempered and gentle yak. We are thrilled to have this girl in our herd! Her first calf sired for us is a black trim Imperial heifer with a heart shaped star on her forehead. She’s already got quite a coat. I can't wait to watch Eva grow up. Kryptolyte's is a Dr Lock daughter from Kryptonite K006, who is a Junior Diamond daughter out of a gorgeous royal cow. She is just beautiful and has that silky beautiful fiber that we all love. Her first 2 years of fiber harvest was impressive. She just had her first calf, Lady “Kai” Kryptonite and is proving to be a fantastic mom. Kryptonite in a pure black Imperial heifer and will make a great addition to our second herd. So far one of my favorite calves of 2018! Rock Me Baby is a true Super-wolly (Rimrock x Cubcadet). She is just turning 3 and is just knocking my socks off. As her previous owner said as he dropped her off "There goes the best yak I ever owned." This heifer's mom is killer, but has never been for sale so we can't wait to see how this lady grows up. She just gets more beautiful every day. She is quite gentle and friendly. So happy to have her join our ranch as the twelfth member of our foundation female line up. She is bred so I can't wait to see what she throws and what kind of mom she will prove to be! Mirage is a Super-wolly and is just as charming in personality as she is in appearance. She's a 2 year old, out of Reflection and Rimrock (Rimrock x Reflection). Nothing but adorable and her lovely temperament will fit right in here. I look forward to watching her grow and to see what she throws. She's going to be a superstar. Brynjarberry is just the perfect little bull calf and growing so fast, we think he promises to be quite large. His farm name is “Larryberry” and his sire is Rolex x Brandy Berry. This Rolex son is cole black and he’s just incredible and we can't wait to watch him grow up as a part of the PS herd. Bjørn Wahlroos is the spitting image of her mother and even at a young age is looking very promising. Black and wooly with extreme coverage, great bone and she definitely has the cute factor locked up for personality and style. She is one of the friendliest calves, and loves people and purple clover.